Tomiko Hood, 90, passed away Sunday December 2, 2018 after a ten year battle with Alzheimer’s Disease at home with husband at her side. She was born in Fukushima, Japan to Shinkichi and Nao Konno. She was the oldest of her siblings, and was required at age 13 to work in a thread factory making military uniforms in Tokyo, Japan. She remembered several of her friends dying in bombing raids on the factory during WWII. Tomiko became a licensed handicraft instructor in Tokyo, Japan in 1975. She taught flower arranging and cake decorating at several Armed Forces Service Clubs and won several awards for her handicraft skills. During the many military assignments with her husband and after his retirement, her main focus was on the care and welfare of their two children until both graduated from college. 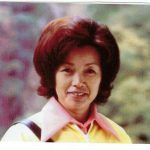 Tomiko enjoyed handcrafts, gardening, bowling and travel with husband and physical health. She attended a local Spa where she met many friends. She has been a resident of the Peninsula since 1978 and of Seaford, VA since 1994. She has been a member of Ft. Eustis Regimental Memorial Chapel since 1998. Survivors include her husband Don Hood of Seaford, Va., a son Mark and wife Sherry of San Francisco, CA; daughter Jeannie Barrera of Sierra Vista, AZ. granddaughters, Raquel Barrera of Hays, VA and Isabelle Barrera of Sierra Vista, AZ, and great grandson Kaleb L. Coates. Also four brothers (Shinichi, Shinji, Shingo and Shijiro) and three sisters (Yaiko, Eiko and Yukiko) all of Tokyo, Japan and sisters-in-law, Carol Hood of Bowling Green, KY., Joyce Hood of Jeffersonville, IN. and many nieces and nephews. The Family would like to thank Riverside Adult Day Care on Old Denbigh Blvd. for their care and compassion during her 6 year stay there. The family will receive friends on Wednesday from 4:00 to 6:00 PM in Amory Funeral Home. A funeral service will be held at 11:00 am on Thursday, December 6, 2018 in Amory Funeral Home Chapel. Burial will be at alter date in Arlington National Cemetery. In lieu of flowers, donations can be made to the local Alzheimer’s Association.